Natural fun learning toddler summer activity. Now that the fun can be taken outside, you will not have to worry about any indoor mess. Just enjoy your toddler. Summer is time for FUN! What kinds of summer theme crafts can you do with your young child? Play catch with water balloons. Cut a large circle our of yellow construction paper. Then, cut long triangles out of yellow or orange construction paper to assemble a sun. 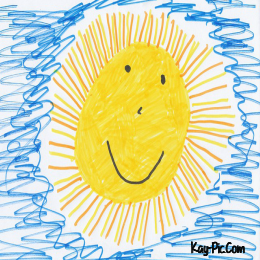 On the sun, glue a picture of the child and write “You are my Sunshine” along the top of the craft. Lemonade and lots of fresh fruits. This is probably the most important toddler summer activity. The purpose is as much for you as it is for your toddler. Layout a bather, sun hat, sun protection cream, sun glasses and an umbrella. Explain to your toddler why they need to protect their skin. We have always told our children that they only get one skin and they need to make sure that they care for it always. Also talk about why we need the sun  to help plants grow, to heat the earth and to help form Vitamin D for strong bones and healthy bodies. Pour 100% fruit juice into lolly molds and freeze. Enjoy on a hot day. Take ice cubes out of your freezer and place in a two bowls - one in the sun and one in the shade. Have fun running back and forth to see which melts first. Drink the cold water. Watch out for un-thawed ice chunks! Inflatable splash pools filled with water or sand are always a hit. Add some plastic cups in the water or spades and buckets in the sand. Expect mixing to occur. Health warning  purchase sandpit sand that does not have lime in it. Turn on your sprinkler and let your little one run in and out. Do this on the lawn. Enjoy a beach visit before the heat of the day  dont forget lots to drink and sun protection! Buy or make your own side walk chalk and let then decorate your paved areas with their art. Find a mold for your sidewalk chalk. You can use small paper cups, toilet tissue rolls, candy molds, etc. Mix the Plaster of Paris and the water together. For colored chalk, add powdered tempera paint to achieve the color you want. Let stand for a few minutes and then pour into mold. Set side and let dry completely. This can take anywhere from several hours to a few days depending on the size of the mold you chose. Once dry, remove the chalk from the mold. If it is still moist, let air dry for another 24 hours. For A Great Easy Toddler Summer Activity... Think Bubbles!! Buy or make your own bubble mixture. 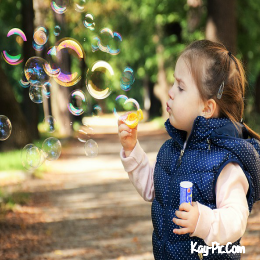 Blow bubbles for your little ones to chase. They may want to blow themselves which is a skill they need to learn, so encourage it. Beware though if they hold the bubble mixture container  they tend to tip it forward and spill most of the contents. You can find some great bubble mixture recipes here ...be sure to consider the giant bubbles for a WOW toddler summer activity! Nature walks are always a joy, little ones can go in a stroller or backpack and older toddlers can walk alongside you. Go in a group if your area is unsafe. Find shady stream areas or go to the sea shore. Encourage your toddler to feel textures. Talk about the colours, sounds, animals and flora you see.